Chase Wildlife provides removal of the most common types of nuisance wildlife: pack rats, squirrels, pine martens, ermine, raccoons and bats. We humanely remove the animals from the home, and our customers feel safe again. Our team is made up of trained professionals that know how to safely remove an animal from the home environment while keeping themselves and the animal safe. 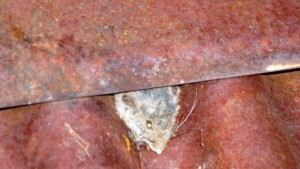 We offer damage restoration services to repair homes that have been invaded by animal visitors. After we remove the animal, we assess the damage, clean the area, perform interior restoration, and secure the entry site. When hired to perform preventative measure services, we check and secure vulnerable areas to ensure wildlife cannot easily invade homes or property. 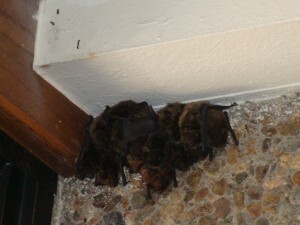 Our team also specializes in bat and bird removal, which can be complicated because of state law and building structures. We safely remove the animal without affecting the aesthetics of the home or commercial building. Our carcass removal service includes locating the animal, removing the carcass, cleaning up additional debris, disinfecting, and damage restoration. If you need wildlife capture and control in Gypsum, CO, or the surrounding areas, contact us. It is the suspicion or knowledge that an animal is in or around a home that brings us to people and the removal of the problem animal is the most essential part of any job. A lot of expertise, experience goes into wildlife capture – one must know each animal, which equipment is going to be most effective, which bait and lures to use, the placement of the cages and all the laws that govern each animal (local, state and federal). Wildlife trapping should not be attempted by amateurs. 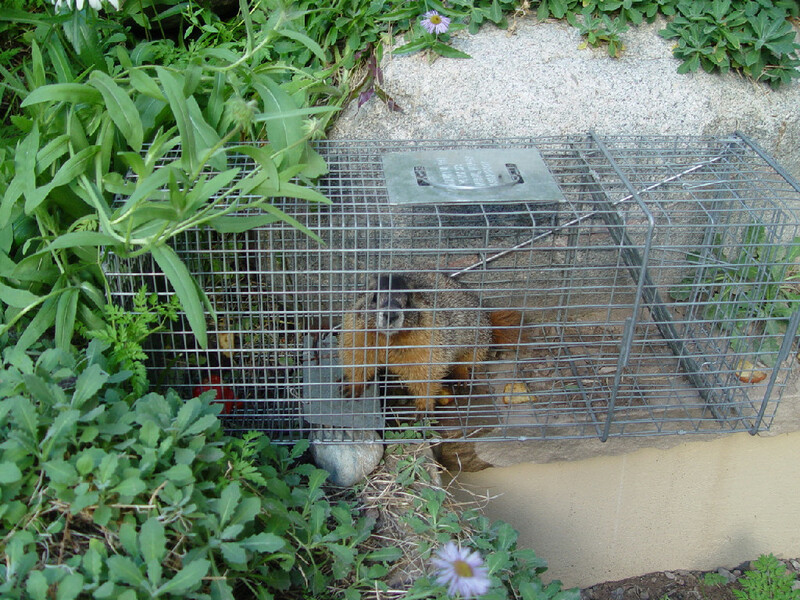 One of the most common problems in this industry is the do-it-yourself people who capture an animal but are not trained or aware of diseases, relocation restrictions, safe handling of the animal, the possibility of young and the potential to leave them behind to die slowly over the next couple of days, which then leads to carcass removal and odor elimination and often times the capture of the wrong target animal. 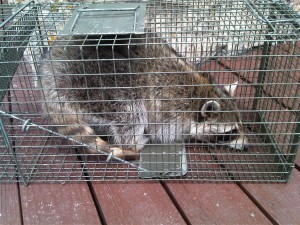 We get a lot of calls from people who wanted to catch a raccoon and got a skunk in their wire cage instead NOW WHAT. Please don’t try it yourself – call a pro. 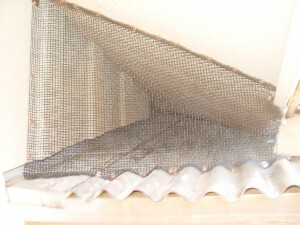 When an animal is in your home or building that animal had to find a way in or create an opening. To create and opening the animals chew and tear creating a hole, and once inside they are doing more that making noise, they are chewing on woodwork, wires and duct work. They are leaving feces, urine, debris and carcass remains inside your home. 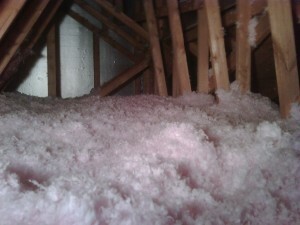 They are damaging insulation or other materials in their area as they create a nesting area. 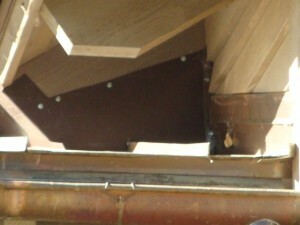 A very important part of the wildlife control involves identification of these damaged areas and repairing the damage. So the first step to correcting all this is remove the animals, and then clean all the debris left behind. This step is considered a bio-hazard clean out as the workers are being exposed to the feces of the animal which can carry diseases such as Leptospirosis, and Salmonellosis. The Rickettsia virus, or even roundworm infection are potential risks, droppings can grow mold, and this can lead to lung infections such as histoplasmosis. Wild animals can also bring in parasites such as fleas, ticks, mites, and more. 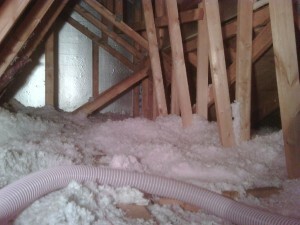 When an animal leaves its scent in an attic, it can actually attract other wildlife. With the interior restoration done the access site must be closed as well, If you don’t fix the hole that the animals have made, what’s to keep future animals from entering the attic via that same hole. No wildlife control job is complete without it. 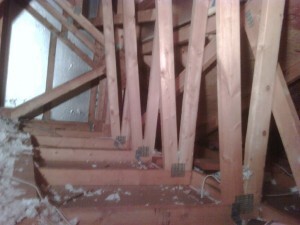 This is particularly true when wild animals have entered your home or attic, then your home has other vulnerable areas. The only way to solve the problem permanently is to find these openings and to seal them shut permanently. 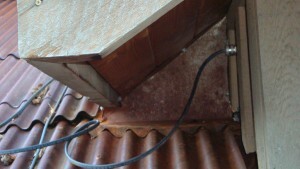 All repairs should be by a professional so that active holes are not sealed and animals abandoned to die inside. 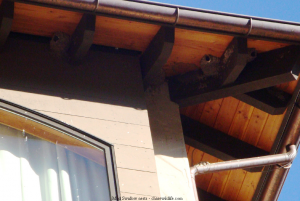 These preventative measures apply to more than your roof, attic and vents, they apply to decks, culverts and other areas where animals can den and nest near your home and create problems. Decks and sheds should be sealed off preventing animals from living under them. If you’ve got an elevated home or mobile home, you know that cats or other animals love to live under there and make a mess. Rodents can crawl under a home and find openings by pipes and by the walls, and climb up into the walls and attic and even under your cabinets. Is something fishing in your ornamental fish pond, we can help. Is your siding done in wood? 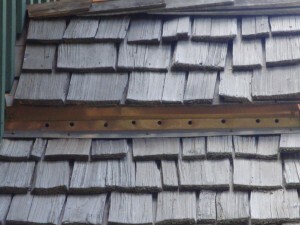 Don’t wait for the woodpecker to destroy your siding. Take action now and prevent the damage, we can help. Does your home have snakes, then habitat modification is in order as well as assuring all access to the crawlspace and thus openings into the home are sealed. Are Marmots eating thousands of dollars of landscaping each day, pocket gophers leave dirt mounds in your grass, raccoons will often peel back fresh sod in search of grubs. Skunks will dig the dirt for worms and grubs. Deer will eat bushes and other ornamental plants. Geese will litter a property with droppings. WE CAN HELP WITH ALL OF THESE PROBLEMS. This is specialty work, and often is the most complicated of the wildlife removal projects. 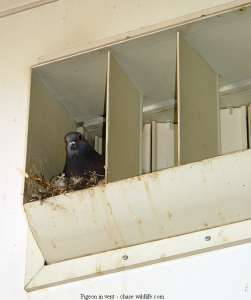 Oftentimes bat or bird removal means accessing very difficult architecture and installing deterrents without ruining the profile of the design, even large commercial buildings. Some birds are protected by The Migratory Act, bats can access holes 3/4 inch (as big round as a pencil). 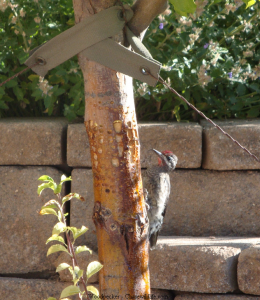 Woodpeckers can do a lot of damage in a very short amount of time. The most common type of dead animal removal is that of a dead mouse, squirrel or sometimes larger. Even the littlest of animals can smell bad enough to drive the owners out of their home. Determining where the animal is located takes skill, some cutting into the walls, ceiling or other areas to find the exact location. Once we are able to determine which area it can still be difficult to find the smaller animals in the walls inside all the insulation, wires, plastic and often times carcasses of other animals that fell victim to the same hole and problems. We can help locate, remove, disinfect, remove the odors and restore you home to pre-animal condition.